Nelson Engineering’s Brent Bennett announced last week that Simon Construction plans to begin work on the intersection east of the Clear Creek Bridge at the Fetterman and Lobban Avenue intersection. 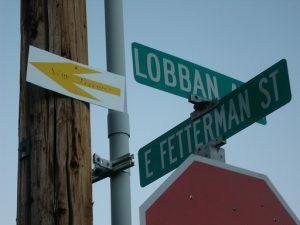 Given the fact that work continues on Lobban Avenue on both sides of the busy intersection, detours will be set up and could be challenging for both the contractor and traffic. Due to the need to re-open the area as soon as possible after the work is done, Bennett announced that Simon will be using High Early-Strength Concrete in all of their pours from this point forward to speed up the curing process to hopefully get the roadways open sooner. Work is continuing on the utilities along artisan row between Benteen and Fetterman and driveway access work will begin this week for the street portion south of Fetterman up to Bennett Street.